Recognized for its personalized marketing and public relations expertise and close collaboration with clients, Redhead Marketing & PR continues to diversify and expand with several new clients in a variety of industries. These include a meeting planning business, new retail, non-profit organization, technology, cyber security and political candidates. The following is a summary of Redhead’s new partnerships and services offered. Having served as Summit County Attorney for the past decade, Republican candidate David Brickey has hired Redhead Marketing & PR for branding, logo design, website development and various additional marketing activities during the 2014 campaign season. Corrie Forsling has enlisted Redhead to develop marketing collateral and to advise on various marketing and event planning efforts for her reelection campaign as the Democratic candidate for Summit County Treasurer. 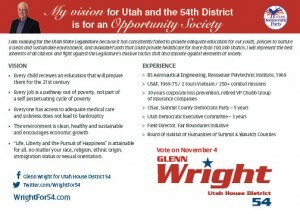 Redhead was engaged for website messaging and marketing collateral development for Democratic candidate Glenn Wright who is running for for Utah House District 54 in November. Redhead has teamed up with this newly established non-profit organization focused on farm animal rescue and advocacy to manage its branding, logo and website development. 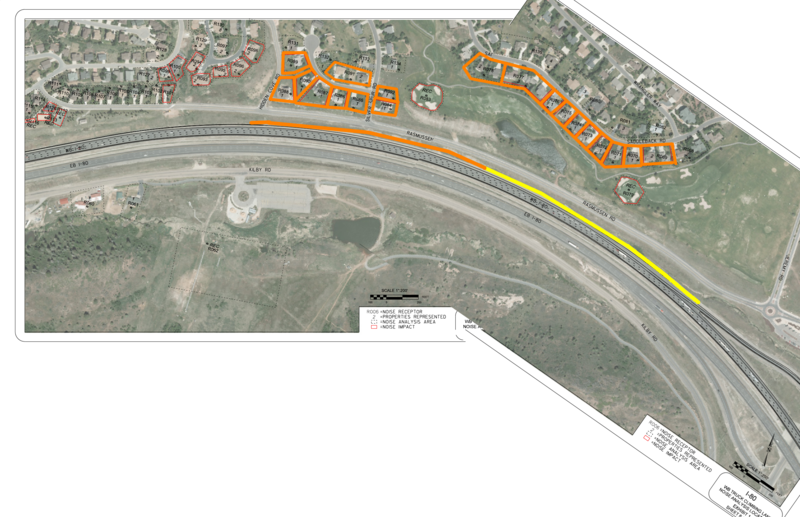 Sage Mountain Animal Rescue will be located on 63-plus acres of land in Brown’s Canyon, 12 miles from Park City, Utah. An inaugural cyber security conference, presented by Idaho-based Critical Intelligence, will be held at The Chateaux Deer Valley in September 2014. The conference will feature high-profile speakers who are experts in cyber security followed by training sessions. Redhead is managing branding and logo development, meeting planning and all marketing collateral. Wasatch & Wool, a high-end knitting and yarn boutique, will open late summer at the Redstone shopping center at Park City’s Kimball Junction area. The yarn boutique’s objective is to offer an intimate, welcoming retail experience with high-quality, natural yarns at a variety of price points. The owner seeks to foster a local knitting community with workshops and social gatherings. Redhead Marketing & PR is beginning work on branding, logo development and website design with public relations and marketing collateral to follow. Redhead designed the logo and developed the website for this new corporate meeting planning/destination management company focused on the Park City market. The new floral design company on Park City’s Main Street that works with corporate and social functions to create trend-setting floral arrangements engaged Redhead to develop its logo and website. A developer and manufacturer of light sources and related technologies for applications across the infrared spectrum and terahertz frequency range, THzDC has partnered with Redhead on the development of a new, more contemporary website to serve its business-to-business needs. Additional Redhead Marketing & PR clients include Advice Media, a digital marketing firm with clients nationwide, and Newpark Town Center, a mixed-use development in Park City. What do a high-end yarn boutique and a political campaign have in common? Very little, except that they are two of Redhead Marketing & PR’s newest clients. We are pleased to be handling the marketing for Wasatch & Wool, opening late summer at Redstone in Park City and David Brickey, the Republican candidate running for reelection as Summit County Attorney in November. Brickey, as he is amicably known amongst his peers and colleagues, has served as Summit County Utah Attorney for 10 years. A moderate Republican, he was first appointed to this office by a mostly Democratic County Council. Redhead will be working to conceive a campaign brand in addition to developing the website and other campaign collateral. We will also manage grassroots marketing efforts throughout the county to elevate awareness, raise funds and get out the vote. David Brickey is the fifth political candidate to engage Redhead Marketing & PR since the company was founded in 2010. 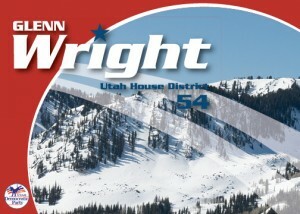 Our other political highlights include managing the successful campaigns and marketing efforts for Park City Mayor Dana Williams in 2009 and his successor, Jack Thomas in 2013. We love the energy and intensity of working on political campaigns! Wasatch & Wool will occupy the space that once housed the CJ Sport boutique at the Redstone shopping center at Park City’s Kimball Junction. The yarn boutique will offer an intimate, welcoming retail experience with high-quality, natural yarns at a variety of price points. With the recent resurgence of knitting as a hobby for all ages, the owner seeks to foster a local knitting community with workshops and social gatherings for knitters. Park City’s only yarn store, Wasatch & Wool is sure to appeal to both locals and visitors with a passion for knitting and creating special knitted products with yarns of superior quality. Redhead Marketing & PR is beginning work on branding, logo development and website design. We will manage additional public relations and marketing collateral needs as well. After a short break following the marketing of Jack Thomas’s Park City mayoral campaign, Redhead Marketing & PR is returning to some of our favorite kind of work…politics! 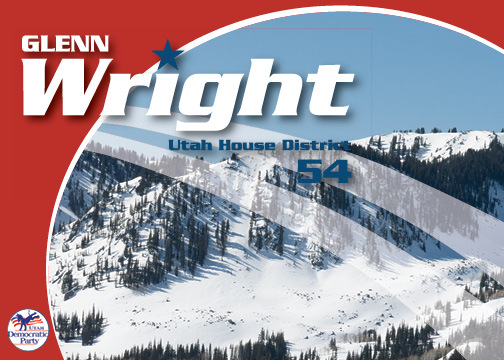 We are pleased to be offering our local political expertise to Glenn Wright, the Democratic candidate for Utah House District 54 and Corrie Forsling, the Democrat running for re-election as Summit County Treasurer. Look for grassroots marketing efforts from both candidates, printed collateral and a campaign to get out the vote for the November 4 election. We’d like to remind Summit County residents of the importance of voting in local elections. These elected officials can have direct impact on our every day life, from our recycling and garbage collection to those pesky pot holes, law enforcement, and how your local tax dollars are spent and invested. 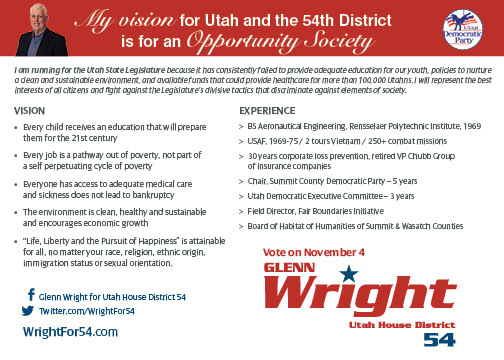 Get to know your candidates, and vote on November 4, 2014!